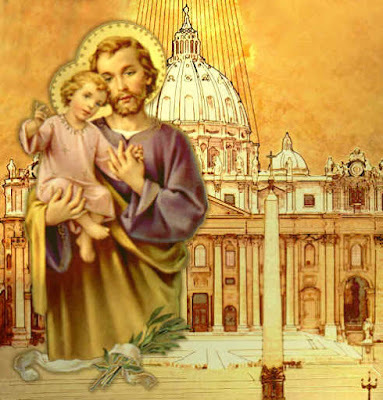 St Joseph: A descendant of the house of David, Joseph was the earthly spouse of the Blessed Virgin Mary, and the foster and adoptive father of Jesus Christ. He is the patron saint of the universal Church. His feast day is celebrated on March 19th. From the Gospel of Matthew (1:16, 18-21,24) Jacob was the father of Joseph, the husband of Mary. Of her was born Jesus who is called the Christ. Now this is how the birth of Jesus Christ came about. When his mother Mary was betrothed to Joseph, but before they lived together, she was found with child through the Holy Spirit. Joseph her husband, since he was a righteous man, yet unwilling to expose her to shame, decided to divorce her quietly. Such was his intention when, behold, the angel of the Lord appeared to him in a dream and said, “Joseph, son of David, do not be afraid to take Mary your wife into your home. For it is through the Holy Spirit that this child has been conceived in her. She will bear a son and you are to name him Jesus, because he will save his people from their sins.” When Joseph awoke, he did as the angel of the Lord had commanded him and took his wife into his home. Sometimes I think about St. Joseph and why he is important. Perhaps you do as well, or maybe you have thought very little about him. Today, I invite us to close our eyes and step into the Scriptures. Imagine being in the household with Joseph and Jesus and Mary. What did their mornings look like? Their meals? Their work? Their evenings? What was it like to be physically, emotionally, and spiritually in constant and regular contact with Jesus? If you are a parent, then you know what it is like to do a million little things for your children that go unnoticed. Just because they go unnoticed doesn’t mean that they are not important. Jesus was put in Joseph’s care. Think of all that entails – he (Joseph) had to be a protector, a provider, a teacher… It seems like he is a very good role model to call on to help those of us who are parents to assist and guide us in our raising and relationships with our own children. Almighty God, at the beginnings of our salvation, when Mary conceived your Son and brought him forth in to the world, you placed them under Joseph’s watchful care. May his prayer still help us to be faithful and loving guardians to those you have entrusted to our care. We make this prayer through our Lord Jesus Christ, your Son, who lives and reigns with you and the Holy Spirit, one God, for ever and ever. Amen. This entry was posted in Catechesis and tagged christ, Church, Dr. Margie Crooks, Jesus, March 19, St Joseph. Bookmark the permalink. ← Darkness: Is it to be feared?